Dubai is a remarkable success story. From its origins as a small fishing and pearling community, the emirate has gone from strength to strength, having established itself as the premier trading entrepot of the Arabian Gulf and, in more recent years, having boomed into a massive metropolis of some two or more million people, most of whom are expatriates engaged in an increasingly diversified economy that has become synonymous with startling and innovative architecture. 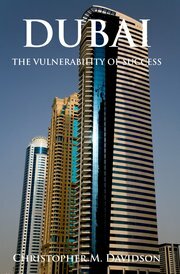 Following a detailed historical background, Davidson’s in-depth study demonstrates how Dubai’s pioneering post-oil development strategies were implemented against a carefully managed backdrop of near complete political stability, despite the lack of democratisation and genuine civil society. He then addresses the problems that may surface as the need for sustained foreign direct investment encourages far-reaching socio-economic reforms, many of which may affect the ideological, religious, and cultural legitimacy of the traditional monarchy. He also analyses Dubai’s awkward relationship with its federal partners in the United Arab Emirates, before highlighting some of the hidden costs of being the region’s most successful free port-namely its attractiveness to international criminal fraternities, the global black money economy and terrorist networks. Publishers’ websites: Oxford University Press; Hurst & Co.